Screw press can be designed according to different sludge type and treatment size requested by the customers. Our company will also provide wastewater system plan, design and testing service upon request. 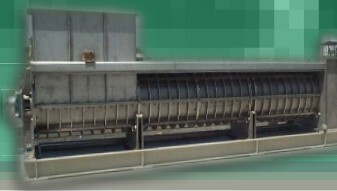 In September 2001, Nan Ya wastewater treatment plant in Shin Gang applied a model NPC-SL850 screw press to treat biological sludge and efficiently lowered hydrous percentage to less than 70%. In October 2002, Nan Ya utilities plant in Chia Yi applied a model NPC-SL400 screw press to treat FGD sludge and efficiently lowered hydrous percentage to less than 40%. In October 2002, Nan Ya utilities plant in Jing Hsin applied a model NPC-SL400 screw press to treat FGD sludge. Nan Ya power plant in Kunshan, China applied a model NPC-SL550 screw press to treat FGD sludge.